The media resound with warnings about a likely Israeli attack on Iran while the U.S. hesitates, keeping open the option of aggression—thus again routinely violating the U.N. Charter, the foundation of international law. As tensions escalate, eerie echoes of the run-up to the wars in Afghanistan and Iraq are in the air. Feverish U.S. primary campaign rhetoric adds to the drumbeat. Concerns about “the imminent threat” of Iran are often attributed to the “international community”—code language for U.S. allies. The people of the world, however, tend to see matters rather differently. The nonaligned countries, a movement with 120 member nations, has vigorously supported Iran’s right to enrich uranium—an opinion shared by the majority of Americans (as surveyed by WorldPublicOpinion.org) before the massive propaganda onslaught of the past two years. China and Russia oppose U.S. policy on Iran, as does India, which announced that it would disregard U.S. sanctions and increase trade with Iran. Turkey has followed a similar course. Europeans regard Israel as the greatest threat to world peace. In the Arab world, Iran is disliked but seen as a threat only by a very small minority. Rather, Israel and the U.S. are regarded as the pre-eminent threat. A majority think that the region would be more secure if Iran had nuclear weapons: In Egypt on the eve of the Arab Spring, 90 percent held this opinion, according to Brookings Institution/Zogby International polls. This entry was posted in All Posts News Politics and-or Videos, China, Dandelion Salad Videos, Iran, Iran on Dandelion Salad, Israel, Israel-Palestine-Gaza-Occupation, Nukes, Politics, Russia and tagged Iran Israel US Nukes, Noam Chomsky, Noam Chomsky on Dandelion Salad. Bookmark the permalink. I am relieved Prime Minister Harper did not endorse Netanyahu’s obsession with starting WWIII/Armageddon with a 1st strike on Iran and strongly stated there can be no other way than a Peaceful resolution. I expected he would endorse it. He has redeemed himself by this statement in my view. What maddens me is seeing outright lies being propagated by the Corporate owned media mirroring the government line. It’s as though the Media, whose only justifiable raison d’etre is to speak Truth to Power, has sold it’s soul to the Devil and has lost it’s backbone. 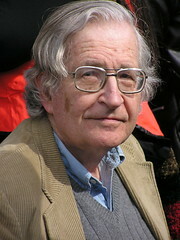 There are those exceptions with people like Noam Chomsky. Prime Minister Netanyahu had a meeting with Prime Minister Harper Today. There is no doubt Netanyahu wanted Harper to endorse an Israeli 1st strike against Iran. Netyanahu and the media in the relentless propaganda to demonize Iran always say as evidence of how evil Iran is, they threaten to close the Strait of Hormuz and is a danger to the world, not only to Israel. They never say Iran said they would do that only if Israel starts the war. The Americans must have been in a state of shock with the arrival of the Arab Spring. It was as unexpected a the Global Financial Meltdown-Economic Pearl Harbour/tsunami- Writing On The Wall of 2008. The problem for Washington was only the Middle East Dictators America supported and armed in the name of Democracy were being challenged by their people. The only Dictatorships not under American control were Libya, Syria and Iran. Something had to be done about that and quick. The masses in Tripoli were not protesting Gadaffi. The hundreds of thousands of foreign workers in Gadaffi’s Libya were able to send money home. Tripoli was a beautiful city before The North Atlantic Terrorist Organization destroyed it. With Gadaffi gone and Libya in worse shape than under Gadaffi, the msm don’t talk about it anymore knowing people aren’t interested and quickly forget being distracted by whatever passing fancy with no sense of historical continuity. Syria is next on the list but Syria is not Libya and Western meddling will make it much, much worse than the mess left behind in Libya. If Israel attacks Iran, the area will be engulfed in flames – Armageddon. We all know what that means.